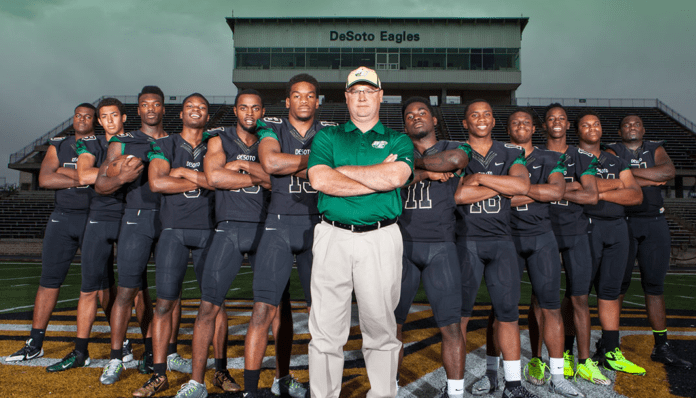 DESOTO—Former Champion Head Football Coach Todd Peterman has found a new home in White Settlement ISD. During a special session White Settlement ISD trustees officially hired Peterman. He will serve as Athletic Director and Head Football Coach for the district’s sole high school campus CF. Brewer High. Todd Peterman’s contract with White Settlement Brewer is for one year and $120,000 in total compensation. The deal includes a $115,000 salary and $5,000 relocation stipend. Assistant Athletic Director and Head Football Coach for DeSoto High School the past three years, Peterman led DeSoto to a Class 6A Division II state championship in 2016. He has a 32-8 record and an 8-2 playoff record. The 2016 District 7-6A Coach of the Year, Peterman has 25 years coaching experience, the past 10 in DeSoto. Under his leadership, 44 athletes earned academic all state honors and 66 received athletic scholarships the past three years. Peterman has two children, Kayler, a seventh grader, and Grayson, who is in the sixth grade. Wade Griffin, Brewer AD for the past four years, recently accepted a Head Coach/Athletic Director position in Giddings ISD. Despite the cryptic statement about ‘fighting to help kids” Peterman said his departure with DeSoto ISD was amicable. In a January letter delivered to Superintendent David Harris, Peterman expressed his gratitude to district and city officials. “I would like to thank Superintendent David Harris, Associate Superintendent Gabrielle Lemonier, Athletic Director Larry Davis, Mayor Curtistene S. McCowan, the community of DeSoto, my football staff, the parents and athletes for the support and opportunities you have given me,” the letter read. Peterman’s last official day in DeSoto is June 30, 2018.